Following a recent Freedom of Information request by the Scottish Conservatives, a number of press articles have been published which create a misleading impression of the efforts being made by Scotland Excel and the local government sector to include food from Scottish producers and manufacturers within its food frameworks. Scotland Excel recognises the importance of the food and drink industry to Scotland and, over the past three years, has been working continuously to include Scottish produce within the supply chain for its contracts and to encourage Scottish companies to bid directly to service our frameworks. As a result of our efforts, the value of food from Scottish producers and manufacturers has increased by 48% in just three years. Almost 31% of the money spent by local authorities through our frameworks is spent on food that has been produced or manufactured in Scotland – a significant figure for a small country. The implementation of a ‘supply only’ element to the frozen food tender to allow smaller producers and manufacturers the opportunity to participate. This has the potential to generate £1m a year for the Scottish fish industry. Increasing the amount of Scottish produce available through the fresh meats and fish framework. In order to do this, while still being in line with EU procurement regulations, we specified Scotch Beef and Scotch Lamb in the tender by including Protected Geographical Indication (PGI). Supporting the national Dairy Action Plan through sustainable farm gate pricing for milk, and the delivery of an additional £1.1m spend with Scottish cheese producers. Scotland Excel is committed to minimising ‘food miles’ wherever possible. More than two-thirds (68%) of the food available through our frameworks in sourced from within the UK. Less of 5% is sourced from outside of the EU, and we will continue our work to reduce ‘food miles’ where suitable alternatives can be found. Finally, we would like to take this opportunity to correct factual errors contained within some press articles. Scotland Excel provides framework arrangements against which councils can purchase food products. Scotland Excel does not buy food on behalf of schools nor control local authority budgets for this. The frameworks do not cover all council food requirements and items such as fruit, vegetables and bread are often sourced locally by councils. The spend figures provided by Scotland Excel under the Freedom of Information request cover spend made by 31 councils that use one or more of our frameworks. The food purchased is used by departments across the council in addition to schools. 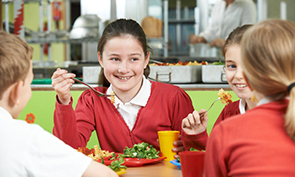 Scotland Excel recognises the important role food plays in the nutrition and education of young people and were part of the working group which developed the Better Eating, Better Learning guidance on behalf of national and local government. We will engage further with Scottish food producers and manufacturers, while continuing to support the delivery of healthy and nutritious school meals through our frameworks.